"The sky is blue, the sun is shining and yet you forget that everywhere there is evil under the sun." 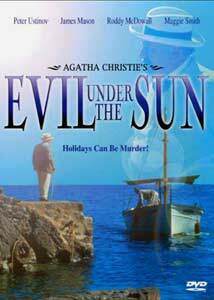 Peter Ustinov returns to one of his most delightful roles, that of Agatha Christie's Belgian detective, Hercule Poirot, in Evil Under the Sun. As is so often the case in films made of Christie mysteries, this is an all-star affair which sparkles in its acting. Unfortunately the resolution is a little less than satisfactory. Ustinov is delightful as Poirot, giving an air of delicate levity to the proceedings. Diana Rigg as the dancer-turned-trophy wife Arlena Marshall is amusingly bitchy, and the cat fur flies when she goes up against hotelier Daphne Castle (Maggie Smith). Sylvia Miles and James Mason are excellent as always in the fairly minor roles of a husband and wife musical production team, and Roddy McDowall takes the character of the fey gossip columnist Rex Brewster and runs with it for all it's worth. The 1937 time period is nicely captured in the costumes and period automobiles, but the most important part of the setting is the musical score. Derived almost entirely from Cole Porter show tunes, it deftly underlines both the frivolous and the passionate events of the story. In particular, the climactic sequence of Night and Day makes for a wonderful piece to emphasize the tension of the events leading up to the murder. While I'm not usually a fan of mysteries, the character interaction is so pleasing that it's very hard to dislike this film. And of course, those of us with crushes on Diana Rigg will be pleased to see her in both bathing suits and evening gowns. Unfortunately, the final explanation solving the crime is so convoluted and depends so heavily on coincidence that the conclusion is a terrible letdown. Serious mystery fans will probably be disappointed in the fact that the central murder doesn't even show up until halfway through the film, leaving precious little time for clues and deduction. Image Transfer Review: The anamorphic picture is generally quite clear and detailed. However, much of the film has a definite bluish cast to it, making skin tones quite purplish and ghastly looking. The exception is primarily exterior shots which mostly look like second unit work. Perhaps the first unit was using some poor quality film? Shadowed areas (of which there are a great many) do tend to be murky and of lower detail. Definitely not a reference quality image. Audio Transfer Review: The sole audio is a 2.0 Dolby Surround track which is adequate for the most part. There is almost no surround activity at all, but there is a decently wide front soundstage. I did not notice very much directionality here. There is no hiss or noise. The wonderful Cole Porter score comes through quite nicely with good clarity and depth. Several of the tunes have excellent bass extension. Extras Review: Some decent extras are included on the disc. In addition to a quite amusing trailer (presented in anamorphic form), there is a making-of piece (15m:15s) that features interviews with most of the cast discussing their respective characters. Pleasantly, this documentary is also anamorphic. The enclosed pamphlet gives a brief bio of Christie, and a bio and filmography are provided for Ustinov. Short 2-screen bios are given for Birkin, Blakely, Mason, McDowall, Miles, Rigg and Smith. Chaptering is quite extensive. Not a great package, but certainly better than bare bones. A delightful and highly entertaining all-star Agatha Christie mystery, full of wonderful character interaction; just don't think too hard about the final solution of the mystery and enjoy the ride instead.